With the next instalment of the Guitar Hero series on the way, digital modelling giant Line 6 is the latest brand to tie up with the popular video game. Guitar Hero World Tour will feature a new Music Studio mode set to allow gamers to compose, record, edit and share their own licks, with the guitar tones provided by a range of Line 6 modelled amplifiers, cabinets and FX. Guitarist magazine's resident Guitar Hero and Rock Band addict Rob Laing comments: "It's interesting to see the game moving into musical composition and if it gets people writing music it's got to be a good thing. Line 6's involvement and expertise may even get young people interested in trying out some of their other products - like the Toneport - that utilise a real guitar. "Personally the idea of writing music on a plastic guitar-shaped controller doesn't appeal but I'm not certainly snobbish about GH and Rock Band like some guitarists seem to be - for me GH is a fun game to pick up and play for all people, it's not a substitute for the real thing or a threat to it. However the Music Studio idea blurs the line to such a degree that you wonder where the whole concept will end up!" Visit the official Line 6 website for more details on the collaboration. 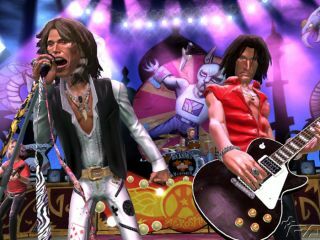 Activision's Guitar Hero World Tour is expected to be released on 27 October 2008 on Xbox 360, Nintendo Wii, PlayStation 2 and PlayStation 3.